Some weeks a story breaks that's just so colossal, so earth-shattering that everything else just fades into triviality. You know, the kind of news that really puts things into perspective. We are, of course, talking about the fact that for the first time in 23 years, Sonic now has blue arms. And a scarf. And bandages on his legs. And Knuckles looks really weird. This week Sega announced Sonic Boom, a new part of the hedgehog IP which will form a brand new game (for Wii U and 3DS) and animated TV series. It's also the first refresh the blue hedgehog has had since he first appeared on our Mega Drives over two decades ago. The gaming community has held nothing back in its response. "Knuckles... what did they do to you?" said Reddit user certze. 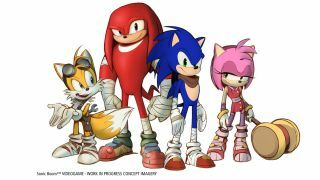 "I figured it out: Knuckles ate Vector," was OkamiKnuX's theory, while Vaxid asked, "I just want to know why the hell do they have bandages on their shoes?" "Quite frankly I feel like the random bandaging of their feet kind of breaks the aesthetic, but that's just me," added IKinectWithUrGF. All good points. But jest as we might, the game does look pretty good. And besides, consider what could have been - apparently Sonic Boom's visual director had even wilder ideas for the redesign. After dying down in the post-PS4 reveal, rumours about Sony's possible virtual reality headset have started ramping up again. The PS Vita Slim went on sale in the UK this week, but what's the TechRadar verdict? Not only did a key Sony exec seemingly confirm it himself, some person, somewhere on the internet this week said they've actually played with Sony's Oculus Rift rival and compared it to Valve's prototype headset in terms of quality. Oculus told TechRadar that it's just not interested in the limited power of consoles, and so will be solely targeting PC for the time being. That means the consoles will need a different VR hero and Sony could time it just right for the PS4. Also in VR news this week, Oculus announced its first exclusive launch game, Eve Valkyrie. Eve was one of the first games to let gamers try Oculus in HD and has been one of the most talked-about VR experiences of the last few months. The announcement is also a teeny tiny hint that Oculus might be firming up its market release. We still have our fingers crossed for a Rift under the Christmas tree this year. It's not just been Sony letting cats out of bags this week. Amazon may have just dropped the biggest clue yet that it's preparing a games console of its own. This week it announced it had bought Killer Instinct developer Double Helix, not something you usually do unless you have some pretty big gaming-shaped plans. It's the third big clue we've had in 2014 that something is in the pipeline. Amazon told TechRadar: "Amazon has acquired Double Helix as part of our ongoing commitment to build innovative games for customers." That "commitment" is beginning to sound an awful lot like a console to us, and having exclusive titles is exactly what Amazon will need if it wants its rumoured streaming box to be taken seriously. Perhaps this could be a multimedia console to take on the PS4 and Xbox One after all. No links from our Future pals this week, but we think you'll enjoy what we've goat for you instead.